Record of Service. Library and Archives Canada, RG 150, accession 1992-93/166, box 3698-53. The entries appearing on these documents are taken from unit Part II Orders. The Orders are the administrative directives concerning the movement of individuals into and out of each unit for various reasons, such as leave, hospitalization, and transfer to and from another unit, as well as changes in financial or ration allowances, or punishment awarded for service offences. 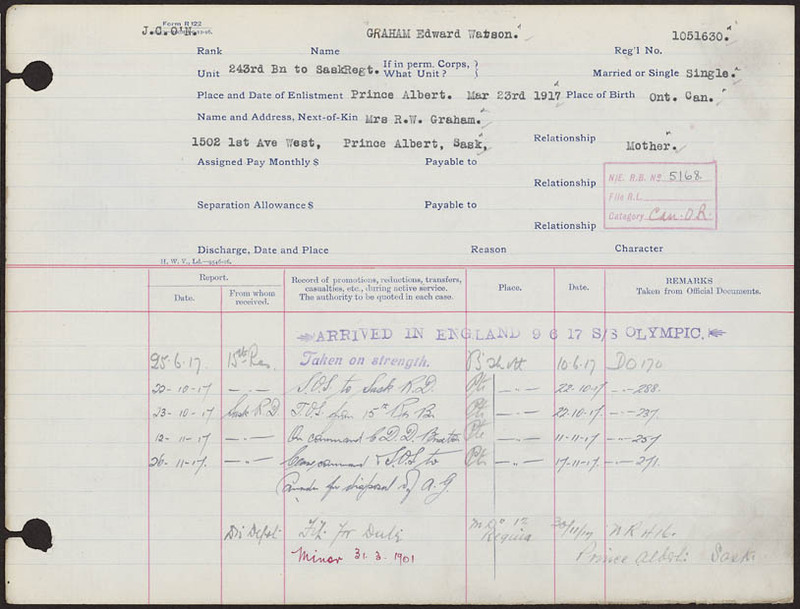 Each unit of the Canadian Expeditionary Force issued these orders on a regular basis, and they are collected in our holdings and arranged by unit and date in Record Group (RG) 150, Series 1. 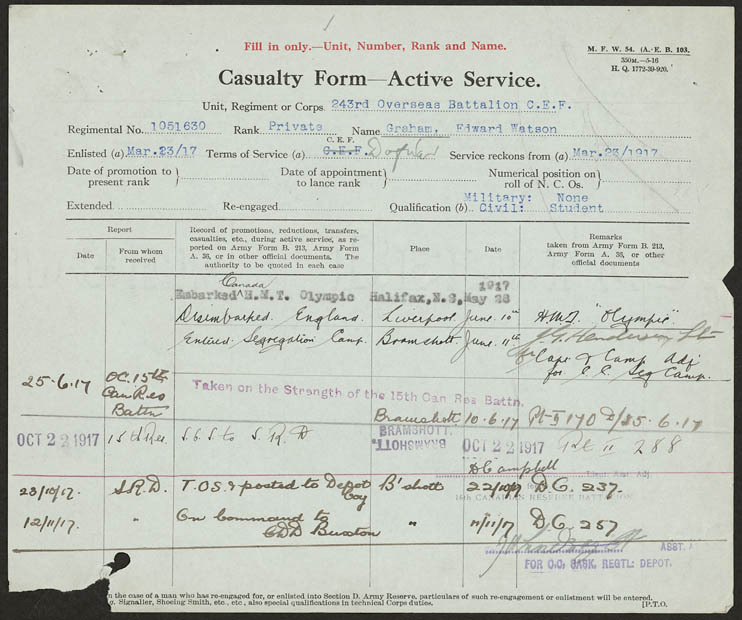 However, each entry for an individual mentioned in the orders is placed separately on his personnel record, with a reference to the order number in which the original entryappears (see remarks column on the image). Date on which a specific report concerning the individual is received by a higher authority. Information about who is making the report. Information about the individual which has been noted in the unit administrative orders. Note: The terms taken on strength (TOS) or struck off strength (SOS) refer to the movement of personnel into and out of a unit. They are usually entered in pairs in an individual's personnel records, recording the departure from one unit and the entry into another, and the dates on which they occurred. Casualty Form. Library and Archives Canada, RG 150, accession 1992-93/166, box 3698-53. Place in which the action noted occurred. Date on which the noted action took place. It should not be confused with the earlier date, which referred only to the report being made (first column). Reference to Part Il Order in which the action is entered.